Toddlers feverishly defend their piece of the world like little tyrannical monarchs. “Mine! Mine! Mine! Don’t you dare ________.” Parents recoil in embarrassment. Onlookers shake their heads and wave judgmental fingers as if they can’t understand a child’s need to claim, to own and to protect. •	Toddlers often carry one object around for hours or days. Descartes said, “I think therefore I am”. Toddlers believe “I carry therefore I am”. •	Toddlers often carry containers to collect things: purses, gift bags, buckets. Toddlers are miniature deities; they hold the entire world “in their hands”. 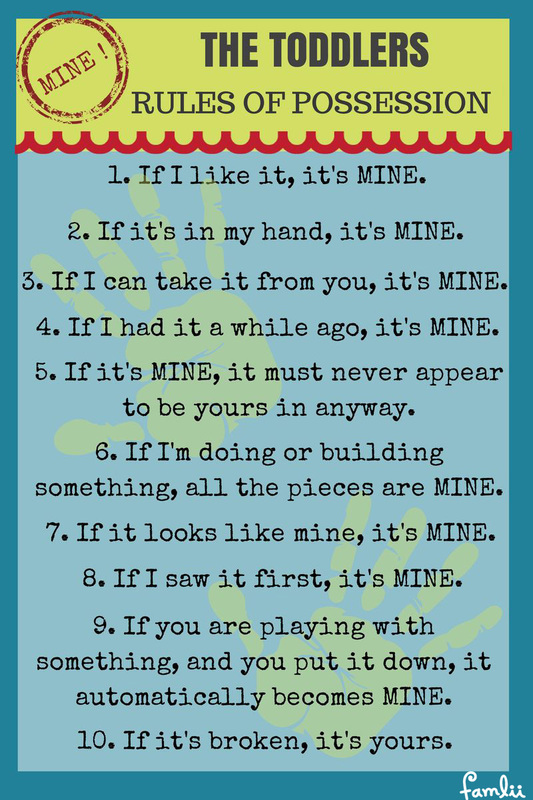 •	Toddlers cannot share single objects until they say so. When adults insist on “sharing”, the toddler feels like someone bigger and stronger has just taken it from them. And they aren’t certain they’ll ever get it back. •	Toddlers may start an all-out tug-o-war over a toy that no one can win. They will either learn that might-makes-right or that the world is a very frustrating place. •	Toddlers sometimes target another child’s stuff – not because they desire a specific object but because the other child is on their social radar. A few months earlier, they’d happily play side-by-side with one another and barely interact. Thus begins, the social-emotional awareness of who I am in a world of others. Sharing and taking turns are not ends in and of themselves; they are the means to getting along with others. Tenacious toddlers are acting their age. They need guidance, boundaries and lots of social practice. Toddlers who learn compassion and empathy are better prepared to navigate social minefields than those who are learn begrudgingly to “be nice”. How exactly do you teach toddlers and preschoolers compassion and cooperation? 1. Begin with establishing emotional calm. Toddlers have extreme difficulty thinking and feeling at the same time. Grown-ups must show the way by engaging without over-reacting. Get close. Get quiet. 2. Stop the action by describing the situation: “Oh, I see you both want the purple car.” “Sara is trying to look at your dinosaur.” Toddlers get blinded by the emotional struggle and can no longer see the problem at hand. 3. Take notice of your child’s feelings and take a guess at what prompted that emotion. Is your child frustrated because he’s not finished with his turn? Is your child acting a little bossy because she just mastered the clean-up rules and she has confidently decided all the kids should put their toys away too? Parents may not know what exactly how to read an emotional situation but your empathetic ability increases with practice. 4. Incorporate a feelings vocabulary into your daily routine: storytelling, pretend play or casual conversations in the car or at the end of the day. Toddlers need to know there’s a whole range of emotions that are normal before you try to describe them in an emotional situation. Validate unsettling feelings in neutral settings with characters like “No David” and “Angry Sophie”. 5. Be an ally through the emotional storm. Children need adults to guide them through complicated emotions – neither dismissing nor avoiding. Frustration and possessiveness need to be acknowledged before your child can learn constructive expression. When parents are fearful, hurt or embarrassed by toddler emotions, they lose the ability to help the child with new, age-appropriate feelings. 6. Finally, present win-win choices. In all parent problem-solving situations, the biggest challenge is figuring out how to meet children’s needs and move the situation forward. What does your child need – time to calm down, a place to play undisturbed or someone to let him know when it is his turn? Show your child in words and action that you understand the problem and that you will help her. Be clear and decisive – it’s your presence that makes the sharing and the waiting possible. For example, show your child where to sit while she waits for her turn. It is with empathy and through empathy that we teach toddlers how to play nice with others. Emotional coaching isn’t always easy but it’s the most powerful tool you can give your child.